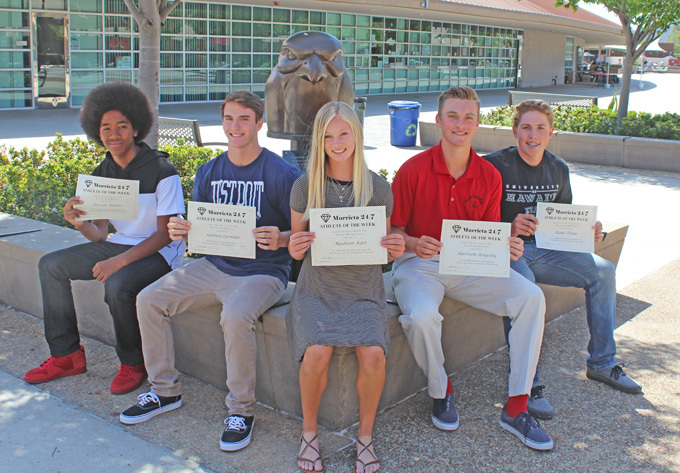 From left: Trevon Waters, Sammy Quinlan, Madison Kast, Harrison Kingsley, Blake Timm. Not pictured: Colton Swingle. Trevon Waters of the boys track team had a big day competing in the frosh-soph division at the Inland Empire Championships last weekend. He won his division of the high jump at 5-7 and finished seventh in the long jump with a leap of 18-8. Freshman Madison Kast, a repeat winner of this award, equaled her personal best of 10-6 in winning the frosh/soph division of the pole vault at the Inland Empire Championships. Senior Sammy Quinlan is captain of the boys lacrosse team. He had a big game against Tustin last week. Colton Swingle won five of six doubles sets last week with two different partners for the boys tennis team. Junior pitcher Blake Timm is 1-1 with a 1.20 ERA for the baseball team. Harrison Kingsley's outstanding performances led the boys golf team to a victory at the Barbara Worth Invitational last weekend. These athletes are eligible for the April Athlete of the Month award. Anyone wishing to purchase a print copy of this article may do so by emailing murrieta247info@gmail.com.